Gov. Pat McCrory says he'll sign the North Carolina state budget bill negotiated by fellow Republicans at the legislature this summer when it reaches his desk. RALEIGH (WTVD) -- Gov. Pat McCrory says he'll sign the North Carolina state budget bill negotiated by fellow Republicans at the legislature this summer when it reaches his desk. 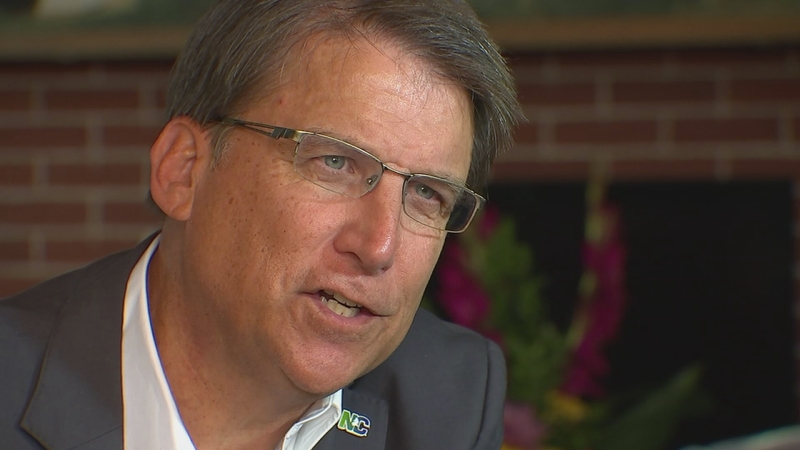 "We got about 90 percent what we requested," Governor McCrory told ABC11 anchor John Clark Thursday morning. "And therefore I do plan to sign it." The budget passed a final vote in the Senate Wednesday with three Democrats signing on. That could signal a strong vote in the House Thursday. If it passes there, it goes to the Governor's desk Friday. McCrory told Clark he was disappointed in both how long it's taken lawmakers to pass a budget and how quickly it was passed at the end of the process. The 450 page document was made public 14 hours before Senators were asked to vote for it. "The process has to change," McCrory said. "It's the same process the Democrats were using for the past 50 years and I don't think it's a process that's conducive to the 21st century. "We need a process that's more transparent and has a deadline long before school starts; a process that's much shorter and that protects the intent of having part-time legislature. If we continue to have legislators start to spend 9 or 10 months here at the State Capitol, we're going to break the intent of a part-time legislature." "I'm going to strongly recommend that we have a deadline. If you don't get it by then, you go home, no continuing resolutions. And it'll all be at least a month or two before starting school. And it ought to respect the needs of local governments and small businesses throughout North Carolina. That's one part of the culture that we still need to change." McCrory was broadly supportive of what's in the new spending document. It's come under fire from teachers and advocates of public education for not providing a meaningful raise to veteran teachers but the Governor pushed back on that Thursday. "We're still providing longevity pay and length pay, so that's not completely accurate. I also have money available to pay others based on market value. We'll be distributing that, a large chunk of money, to salaries based on market value and also performance." McCrory pointed out that all state employees - including teachers - will get a one-time, $750 bonus this year, and although some have called the incentive "insulting" and "another slap in the face;" still, McCrory defended the budget's implications for education. "Teachers are still getting a step increase and we have our teachers between one to seven years of experience who are going to be making at a minimum $35,000 a year, up from $30,000 in a short two years. That's more progress that's been made in the past 5 or 6 years. So I hope the legislature and this administration gets some credit for finally putting a focus on teacher pay which hadn't happened in the past 5 or 6 years." McCrory was also supportive of the changes to the tax code embedded in the budget. It lowers personal income tax and expands the state sales tax, which some have called regressive (more of a burden on lower income families), and which the state's Fiscal Research Division has said will cost the state money in the long run. "There were gloom and doom experts on the last budget too," McCrory said. "And the gloom and doom did not make it. In fact, I don't know where all the gloom and doom analysts are today, because right now, we have a 425 million dollar surplus when the 'gloom and doom left' said we'd have a billion dollar deficit. So we feel confident that those numbers are going to work." McCrory touted the budget's investment in the state's rainy day fund, which he said will be the largest in the state's history. He also defended cuts that singled out and defunded teenage pregnancy prevention programs run by Planned Parenthood because the group provides abortions. "The services will still be provided but by other groups," said McCrory. "That money will still be available to many, many other organizations that need to provide services to help women throughout North Carolina. So those services will still be provided, just not by that organization."